Infinite Campus plays a vital role in how Schoology operates. Every course and user account originates in Infinite Campus and then makes it way to Schoology. There are times that some basic troubleshooting of parent Schoology accounts is needed at the building level. Parents access Schoology by going to app.schoology.com, not Ceran. Registrars and office staff have special permissions in Schoology. If you are a registrar or member of the office staff that helps parents with Schoology and you need your permissions elevated, please submit a ticket here. If a parent would like access to Schoology the first thing to check would be if they have a full parent portal account in Infinite Campus with a unique email address. If they don’t, they would need create a parent portal account using GUID number and wait 24 hours for an email from Schoology that provides login instruction. Here is what that email to parents will look like. If the parent already has completed IC account but didn’t get an email you can check if they have an account in Schoology by logging in to schoology.svvsd.org and finding the Manage Users tab on the left hand side. In the upper right type the last name only in the ‘Search’ box. If you don’t find the user, but know they have good parent portal account in IC it is possible that user is associated with a different building that you don’t have access to see. Or they are an employee in a different district that also uses Schoology and that district is using their email address for their Schoology account. Solution: Email the SVVS HelpDesk to assist or submit a ticket directly here. At times it might be useful to click on the ‘Roles/Advanced’ tab to see what role the user has and what buildings they are associated with. However, you should not edit or create any data in Schoology. That is all controlled by Infinite Campus. Here are some examples of common account issues in Schoology and how to send log in information. Example 1: Correct account and they need login information. Here is an example of an account that looks correct, and the parent has not changed their Schoology password. Click ‘Save’. This will send an email to that account. Example 2: Correct account but they have already changed their Schoology password. If a user has already logged in to Schoology and changed their password you will see two ** in the password box. 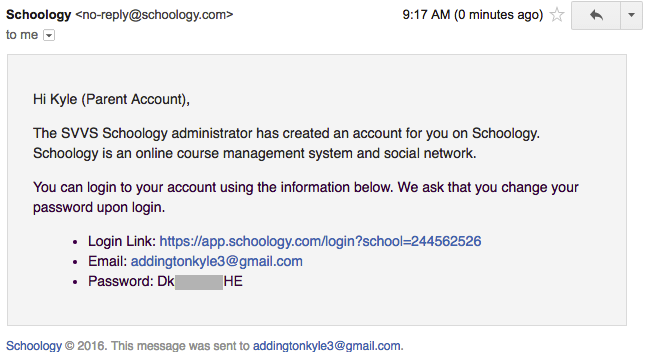 Let the parent know what email address Schoology has for them and send them to schoology.com to reset their password. Example 3: Incorrect account with username, but no email address. If the user does not have an email address listed the most likely because they don’t have a unique email address in IC. It is possible that email address is being used by someone else. If parents use a single email address, only one of them would have a valid Schoology account. Go back to IC and see if the parent has an primary email address listed. If they do, copy and paste that email into the search box of Schoology because that may tell you who that email address is associated with. If the two people using that email address are comfortable sharing that information with each other that is fine. If the parent would like their own account they would need to input a new email address in IC. Because there was actually an account already created, you would need to send this user their new login info after the IC account was updated using the method mentioned above.